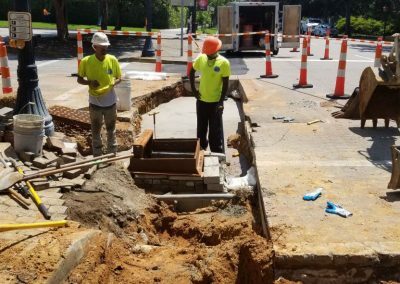 Work on downtown infrastructure continues along Newberry Street and Park Avenue SW. On Sunday, Aug. 12, starting at approximately 10 p.m. until around 5 a.m., water will be shut off at the corner of Park Ave and Newberry Street for the removal of an existing fire hydrant and installation of a six inch gate valve. 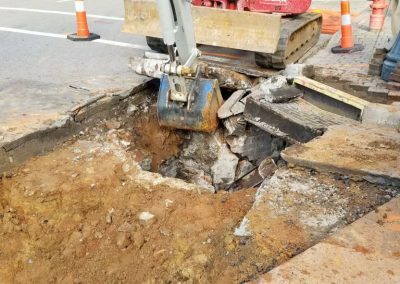 The northside of Park Avenue between Laurens Street and Newberry Street will be without water during that time. A boil water advisory will be announced and door hangers will be placed on the doors of those affected. Continue to watch for any lane closure signs. Work should not interfere with any other existing water service during this process beyond the brief Sunday planned outage. Park Ave STA. 15+81 (I-42; bottom) to STA.16+03 (EXMH-39; top) – 18” RCP installed and backfilled with #57 stone. 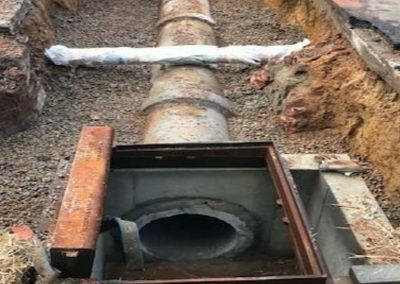 6” water main (Phase 1A) wrapped (08/08/18). Park Ave STA. 15+81 (I-42; bottom) to STA.16+03 (EXMH-39; top) – Flowable fill previously poured, contractor repairing leveling bricks on I-42.